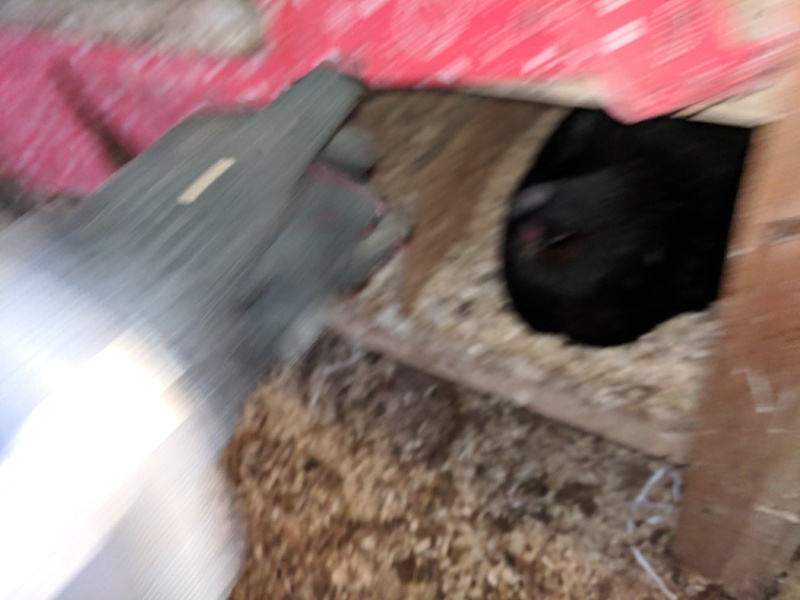 This is just a brief, no pics update on the status of our coop. Yesterday morning, I moved Dots’ med cage to sit next to the coop, so he could be seen but not touched. After observing him ‘talking’ to the girls, I decided to leave him there for the day. It would help if they could see him. When I returned home from work, I gave him his daily supervised visit. There was some chasing, but not bad. 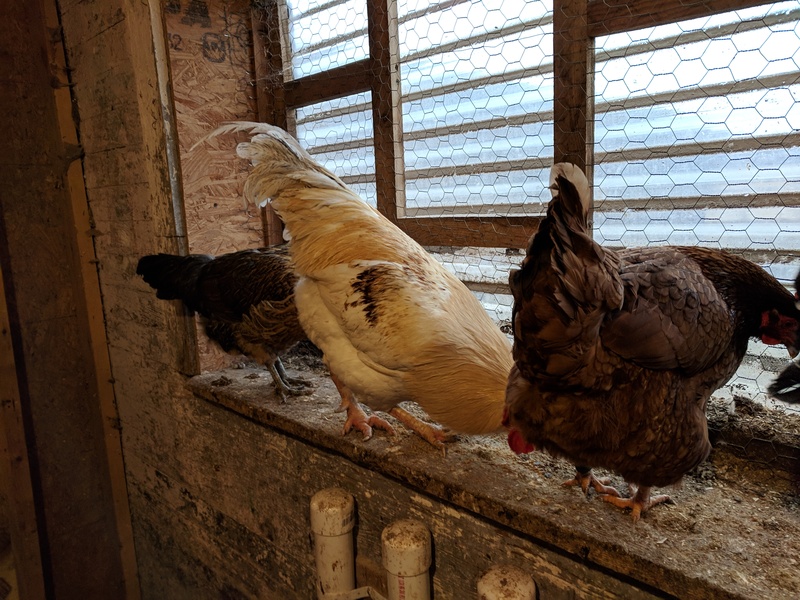 Last night, after spending an hour before lockup with the flock, Dots went up to the rooster to sit next to his sister, Abby, and Maicey. I was hesitant to give him because him sitting next to the hens rather than being afraid of them is preferable. So I kept watching. 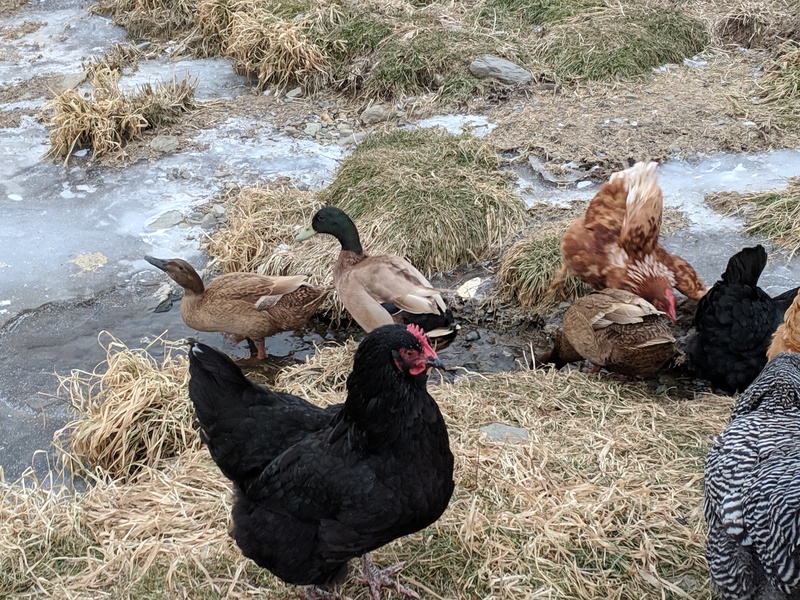 As everyone found their way to the roost, Philip eventually joined them, choosing to sit in the same general area as Dots. 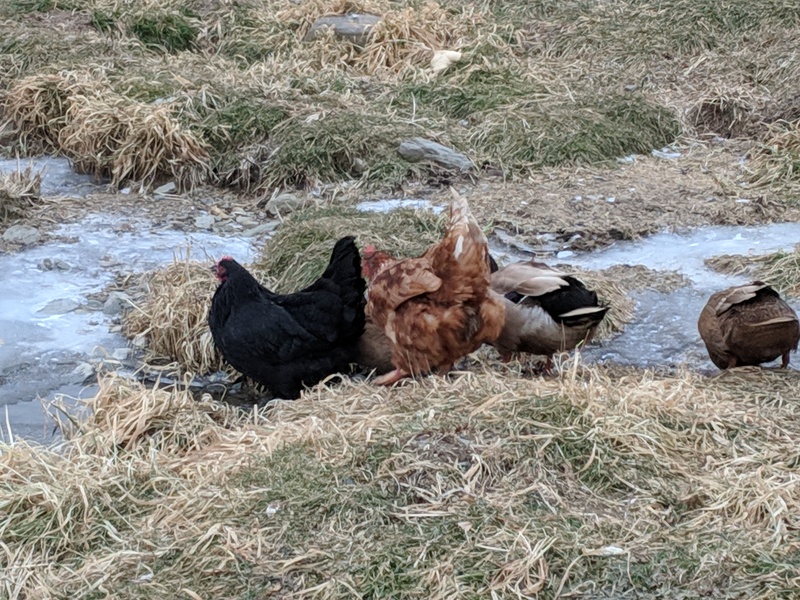 In the jostling for positions, he wound up with one hen between them. I watched, nervous, to see what would happen. 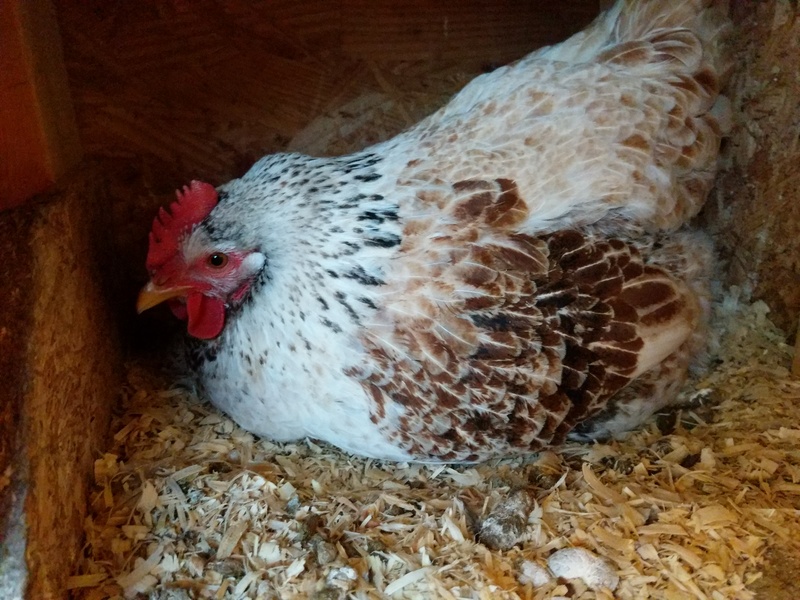 Philip reached over the hen twice to try and pull Dots’ hackle feathers (but never actually did) and finally settled in to sleep. Dots settled in, nestled between Abby and Maicey, and that was where I found him this morning. I did some more observing this morning, and other than a mild altercation with Sylvester, I saw nothing to be concerned with. Philip did not see the need to attack. On the issue of Dots’ eye, it is healing. It looks better. He’s been waking up with it shut due to watering, but the Vetericyn spray opens it up and it remains open all day. His status is the coop is still up in the air. Sylvester is still trying to secure his bid for 2IC. Based on this morning’s bought of chasing, he still views Dots as a threat to that. I don’t. 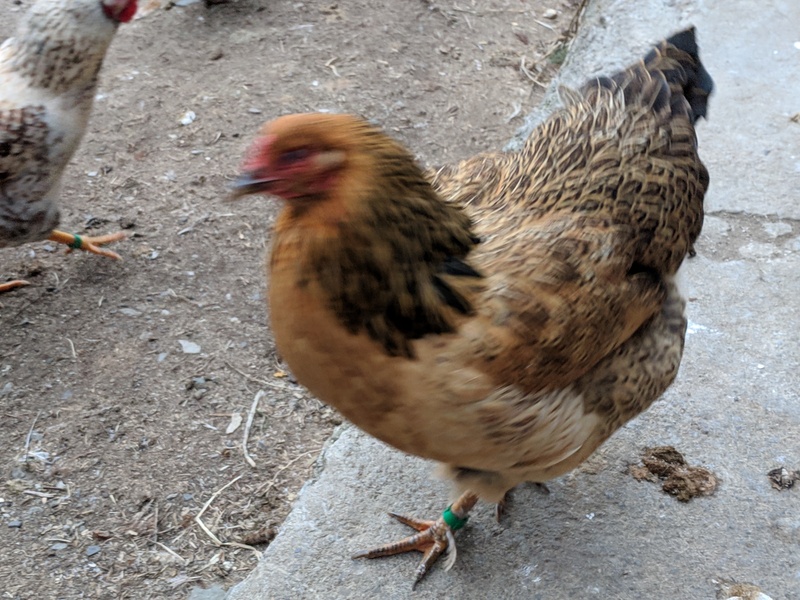 Dots has been making submissive rooster noises, noises I associate with hens and younger boys. If Sylvester and Philip come that same conclusion, maybe life will go back to a new normal. If they don’t, we need to keep Plan B on the table. 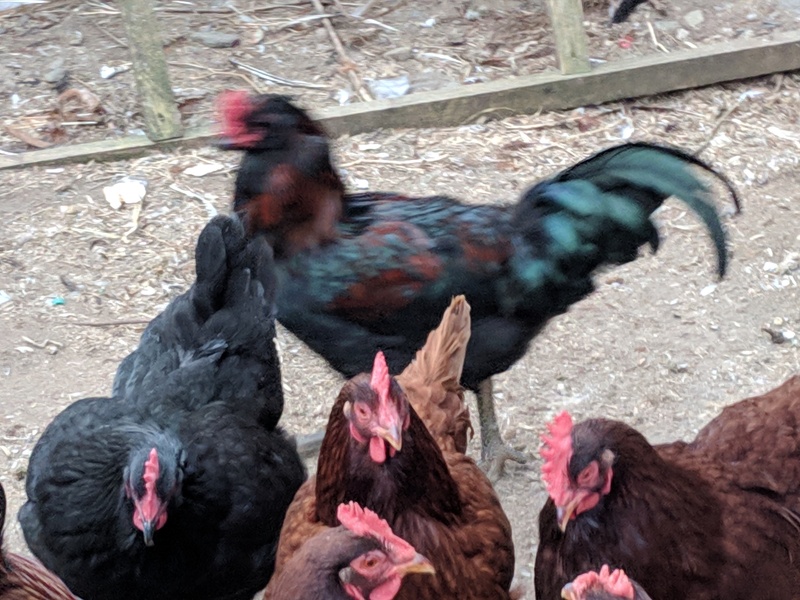 However, if we go for it, the other summer roosters are ready for Freezer Camp. Or the Pressure Cooker. 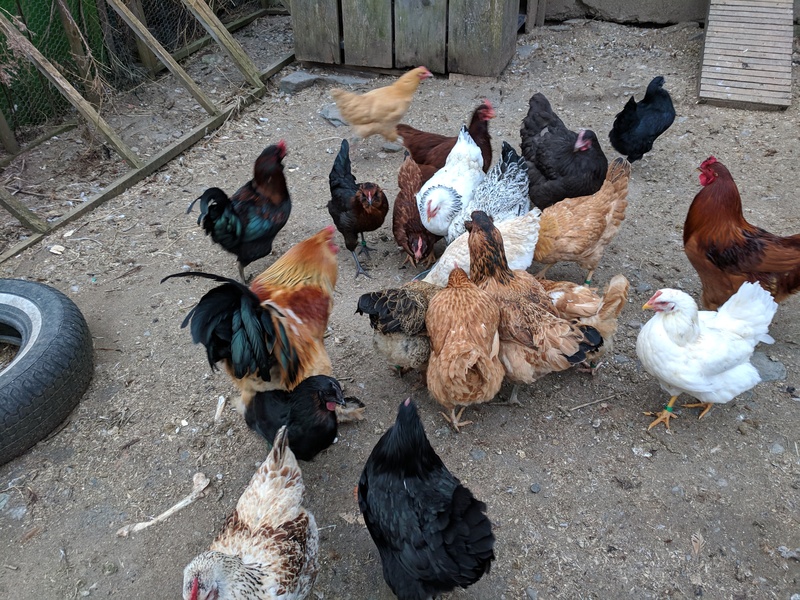 This bunch in particular is very rowdy and there is too much chaos in my coop. 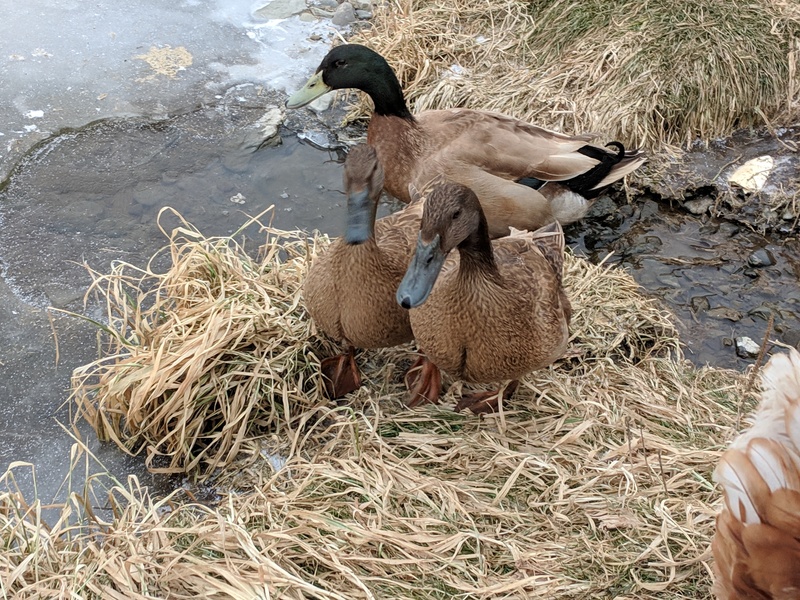 I suspect getting ride of them would help settle things for the boys left to protect the flock, because their hands would suddenly be full of hens in need of protection. Could Dots be included in the boys going with Plan B? I don’t know. I want to see how he is received in the next couple of days. If the new head rooster and 2IC can accept then, maybe not? I will admit ( and this is hard) that my orginal plan was to remove Dots this spring to make way for new blood. By “original” of course, I mean back when we first decided to keep him in the first place. So… About three years ago, before we knew he was going to be such a loveable rooster. I’ve flip flopped about it since then. However, watching this dominance struggle reminded me that he won’t live forever and that, if the Boys don’t think he can still do his job, maybe they know more than I do. Them being actual roosters and all. At this point, however, I don’t particularly want to cull him after spending a week trying to heal his injuries. It seems inhumane to have gone through those motions. If they can accept him as a ‘regular joe’ then maybe I could still hold off to spring? 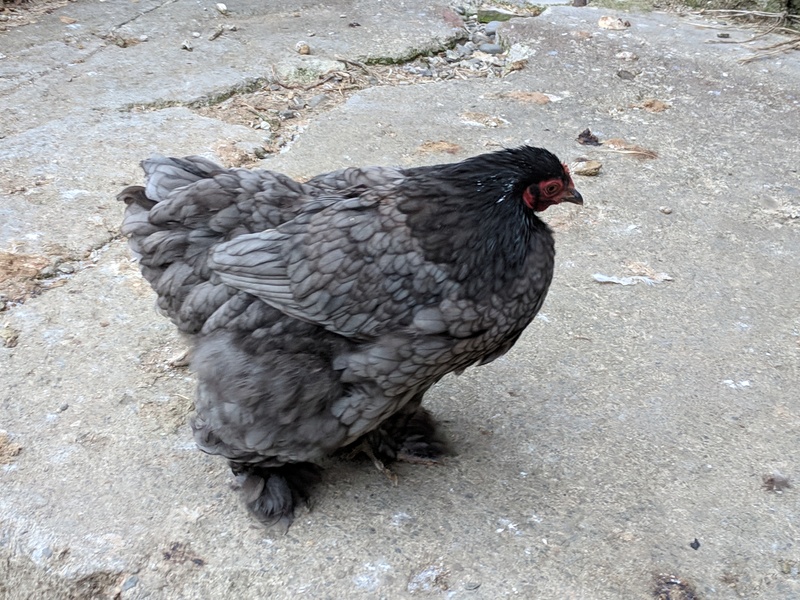 I do have a short list of older hens I’d like to cull, to make room for new chicks. It has been four years. We do need fresh genetics. It’s just always a hard call to make. I welcome insights, if you have them. Well, here’s a brief update on Double Dots. His eye is, as you can see, doing much better. We are still treating his eye 3x daily with the Vetericyn spray and ointment. It’s helping. He can hold his eye open so much better. It also does not appear that the eyeball itself is damaged. That all is the good news. The bad news is that Dots appears to have PTSD now. I’ve been giving him supervised visits with the coop and flock. I put in there with them and stay close. Watching. Philip (aka Leapy) has chased him twice. Gone after him once. He’s run from him both times. 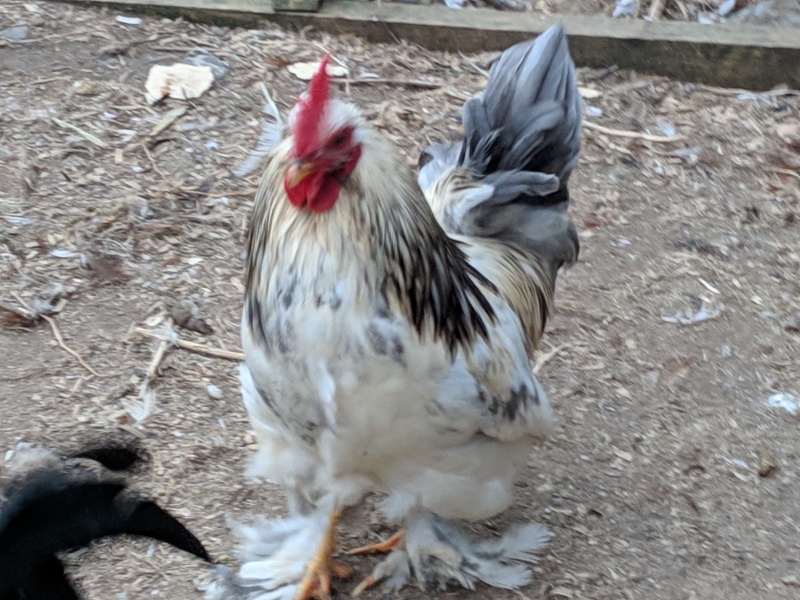 Sylvester, my usually friendly Brahma boy, went after him today in the coop and pulled a feather out. And when Henrietta, who is usually Dots’ friend, came up to him to say “hi” he literally jumped on top of my shoulder to get away from her. 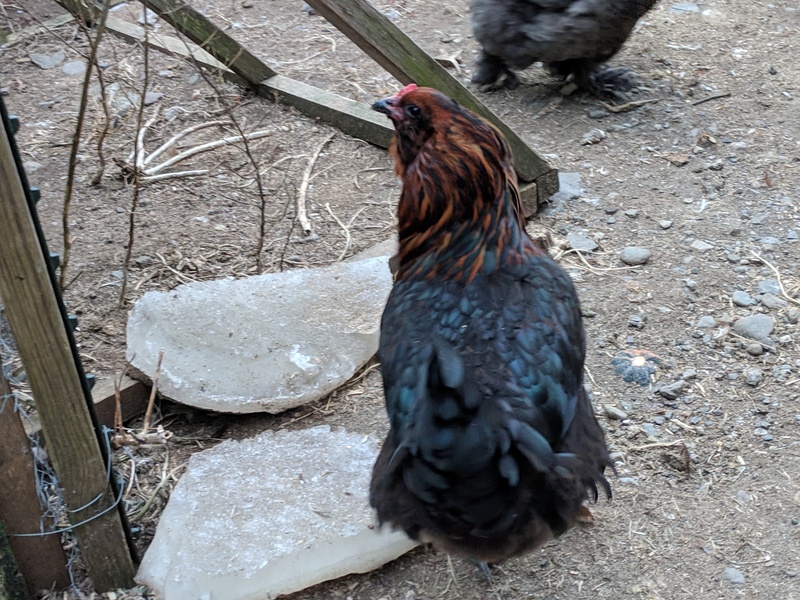 While sitting on the roost with me observing him, Lola (a sexlink hen) came up to sit next to him. He awkward and quiet. He did not at all act like himself. I’ve been visiting Google a lot. Looking up other sites to find out what can be done. I can accept that Philip (and perhaps Sylvester too) have wrestled control of the coop away from Dots. But I wish with all my heart that he can return to the flock when his eye heals without more clashes. 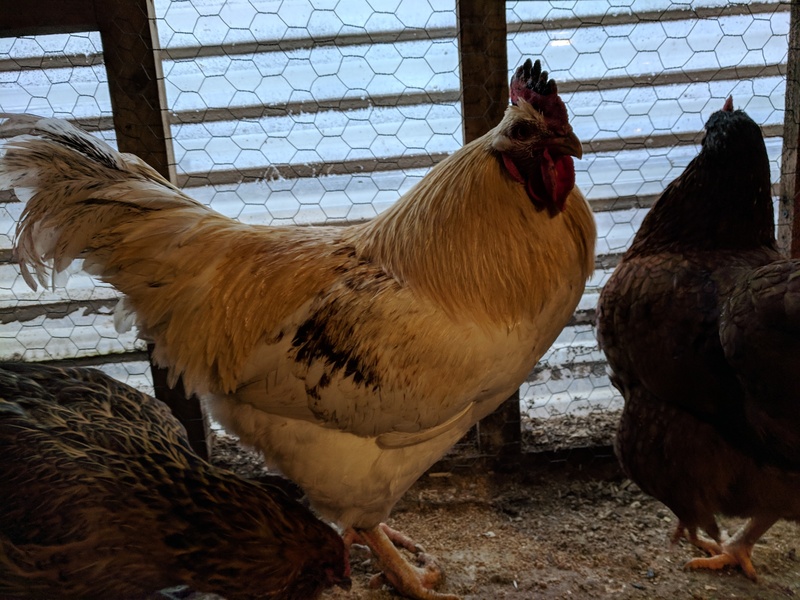 Google says that in most cases, the surrendered rooster will be okay so long as the new Main Rooster does not continue to harass him. A little integration may help. 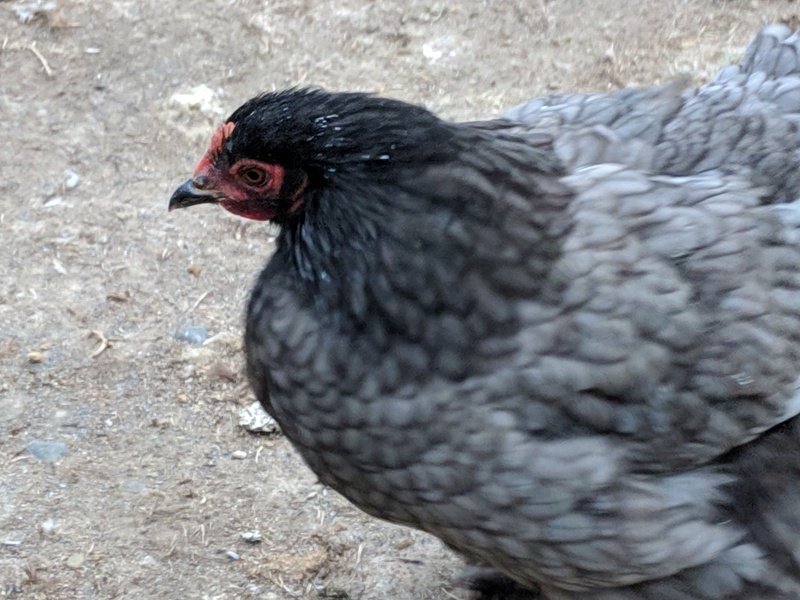 I’m thinking that if his eye is looking any better by Friday, I may move the med came into the coop to ‘reintroduce’ him to the flock. If the boys can’t go back to something that looks like normal, we maybe have to go to Plan B. However, after today, I worry about how timid he was with Lola and how afraid of Henrietta he was. It’s definitely PTSD. And that concerns me, because if he cannot even talk to the girls, how can he live with them? Also, Plan B… an unprecidented winter Freezer Camp. My DH hates culling in winter. We usually do fall or spring. There’s va good four months to go before we’d consider it again. So if the Boys don’t find a new normal that includes Dots, we need Plan B. But who do we send to Freezer Camp? I like Sylvester. He is a big boy, but has a temperament not unlike Dots. He’s friendly and I can pick him up. Philip is Pip’s only child. I like him too. Dots is … Dots. But if he can’t reacclimate to hos ladies, should he be the one to go? I hate making these decisions. They make my heart hurt. 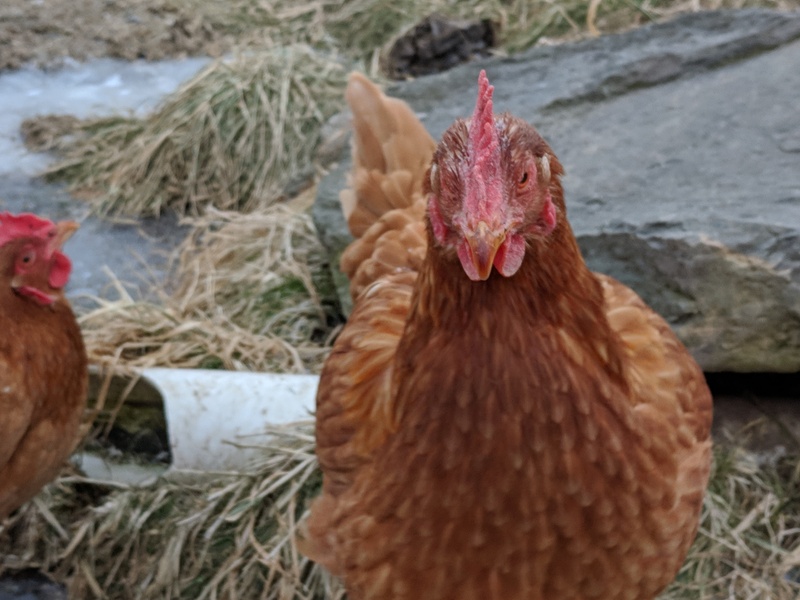 I went down to our coop this morning to do usually morning thing. Feed the chickens, let them out, make sure the dropping boards are clean and the nests are free of poop. 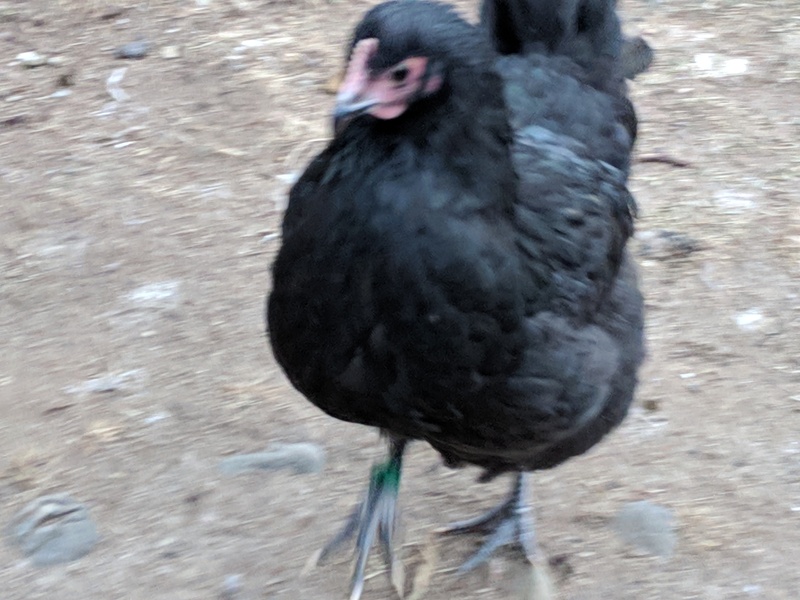 I was surprised however, to see our main rooster, Double Dots, already outside, alone and walking funny. Hunched up. Covered in blood. 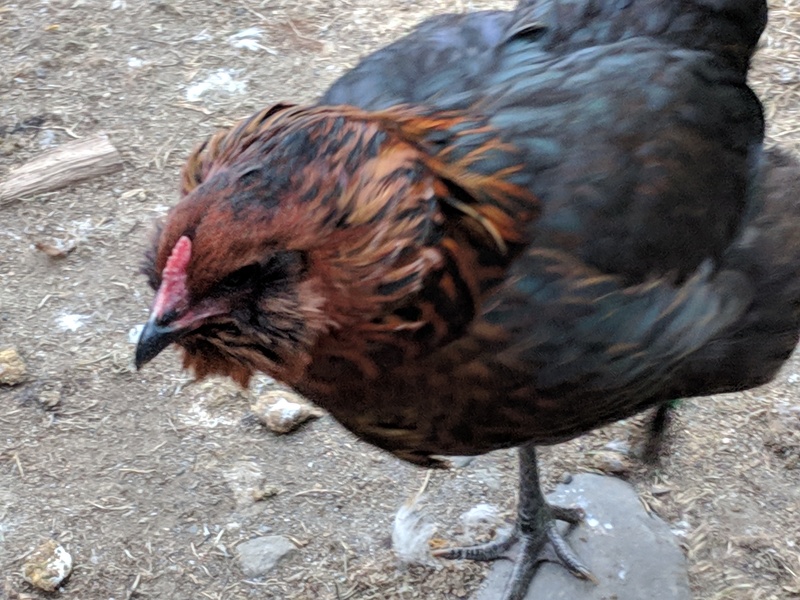 At first I think that maybe we forgot to close the coop last night and am suddenly terrified that bloody rooster = dead chickens. Dots got locked out. All night, on a night where it was less than 19-degrees (farenheit), with a wicked wind blowing from the north. There are so many things going on in my head. 1. Was Dots attacked in the night by predator? 2. Why was he outside? You see? 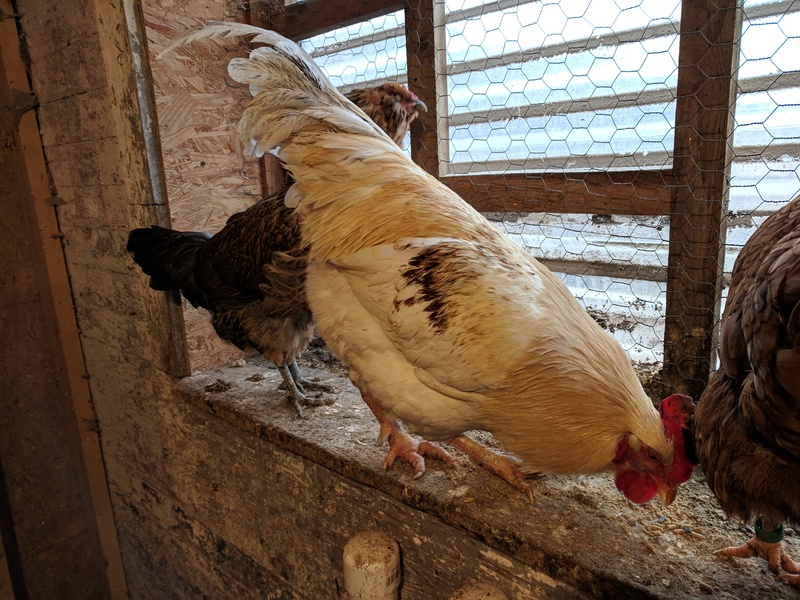 Dot is usually the first rooster in the coop, and he usually dictates who goes inside first. However, we have a handful of young Roo-lings who were too young in September /October to send to Freezer Camp… and Dots is almost 4 years old. Could it be that he was outside when everyone was inside because there is a dominance war going on? Could someone else be stepping up to wrestle the role of Main Rooster from our Dots? Dots was injured, his eye and comb pretty beat up. I have him in the dog crate that doubles as a hospital ward / broody breaker. I checked him over, there are no body injuries, just his eye and comb. Cleaned him up with warm water and sprayed his comb Scarlex oil and his eye with Vetericyn spray. Called Tractor Supply to see if they had eye gel, and learned that green tea works for eye injuries too. He will need to be separated from his flock until I can be sure his eye will get better. He will need care and patience and a lot of prayers. I’m trying to practical. 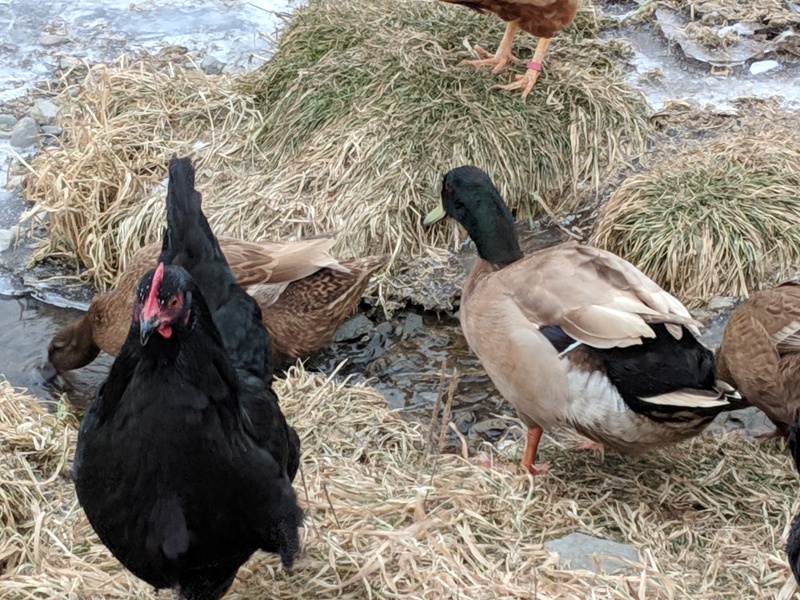 If his eye does not get better, he’s not much use to his flock. But this is our Double Dots we’re talking about. If I have to cull, I will be heart broken beyond words. 3. Double Dots is one tough roosters. He survived all night, injured and alone. He deserves to pull through this. A couple of weeks ago, a troubling thing happened. I was standing in the barnyard observing my flock, as I am prone to do. Pavelle had her babies outside and I wanted to get pictures. Also, as I am prone to do. 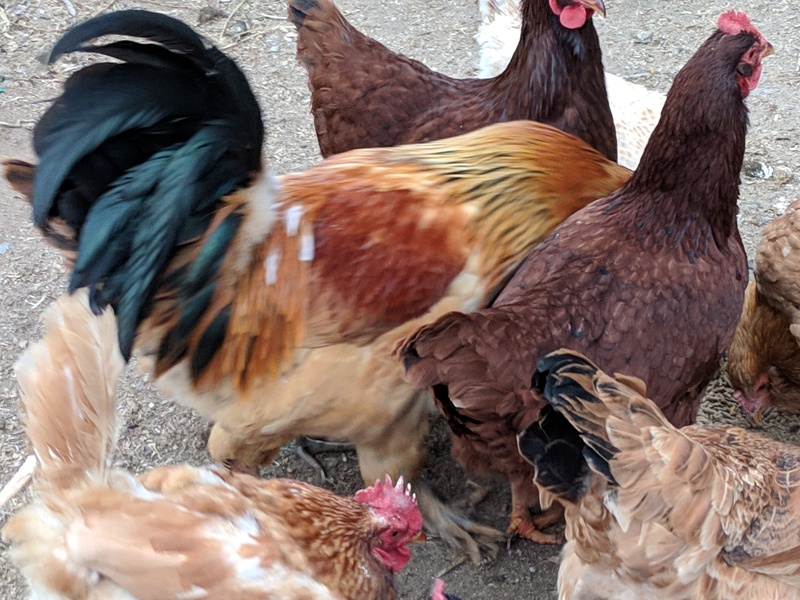 The chickens were milling around about me, as they are prone to do. 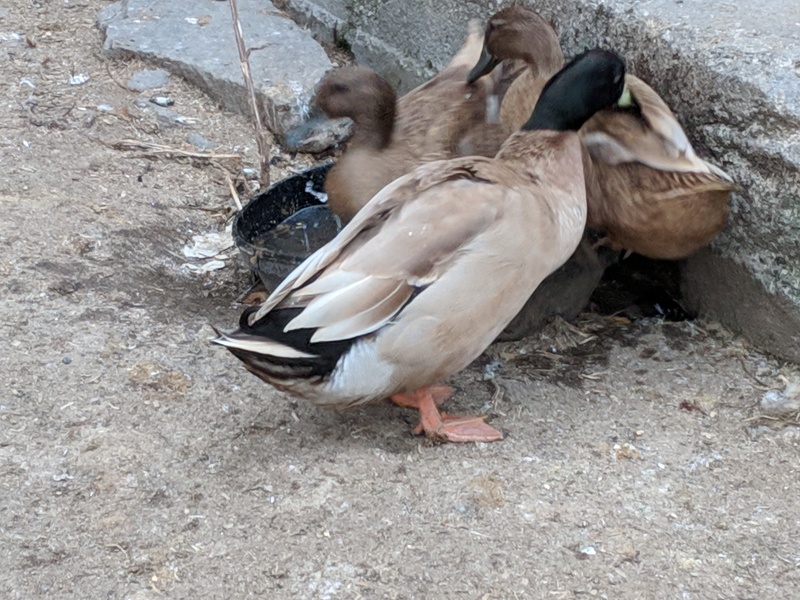 I was holding my phone, paying more attention to Pavelle and her babies than anything else, when sudden my I heard flapping of wings and felt bird feet on the back of my head. A couple of seconds later, my head rooster, Dots, goes flying over top my head and lands on the ground next to me. He flew at my head. It was puzzling, to say the least. Was he attacking me? Trying to perch on my shoulder or head? Needless to say I’ve been a little (a lot) more mindful of where he is in the barnyard when I am down there now. And then… Yesterday it happened again. 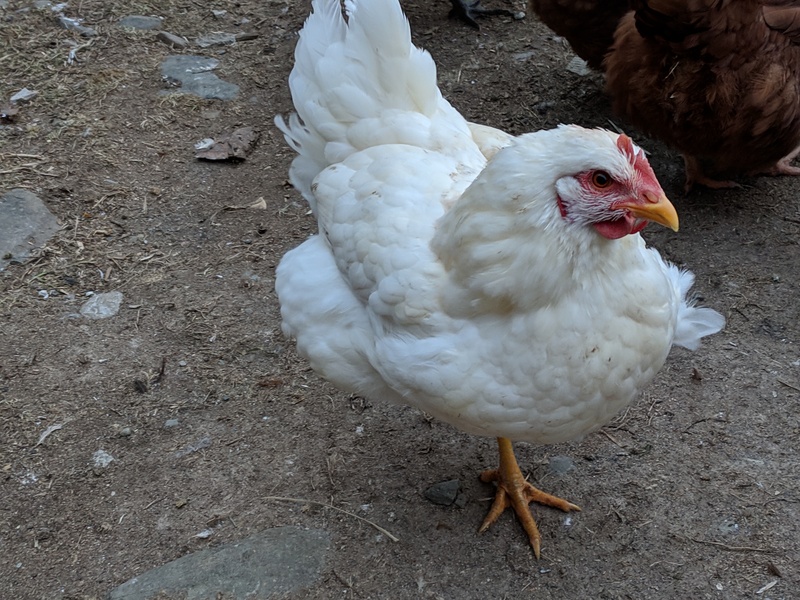 I was in the barnyard with my daughter, watching the chickens. She was holding her favorite hen. Dots was behind us on the barn stairs and suddenly starts flapping his wings and launches himself at me. He did not connect this time or get as high off the ground. But my Girl witnessed it and needless to say, we were both shocked. 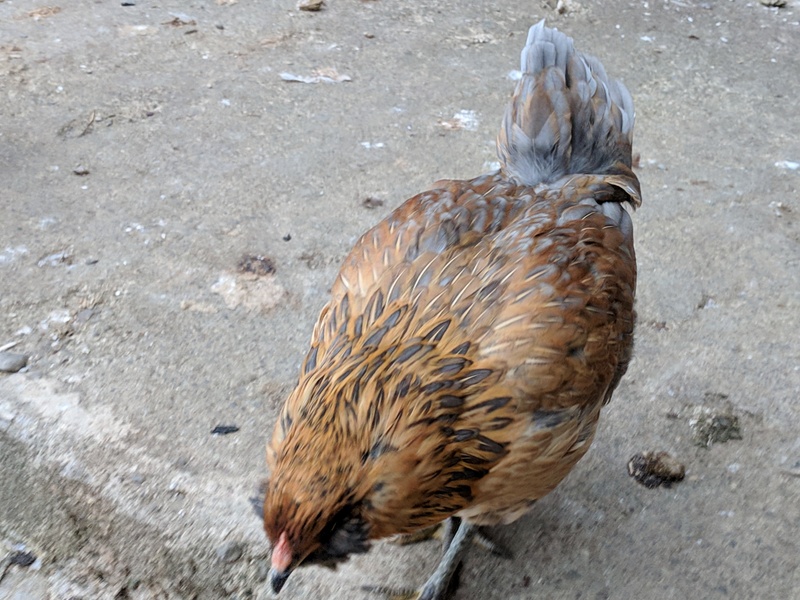 This is a rooster I have raised from a baby. He usuallyets me pick him up, cuddle him, let him. He comes to the sound of his name. If I sit on the steps, he has been known to come and sit on my lap. So, I ask myself, “what is going on with my handsome man?” Have I done something? 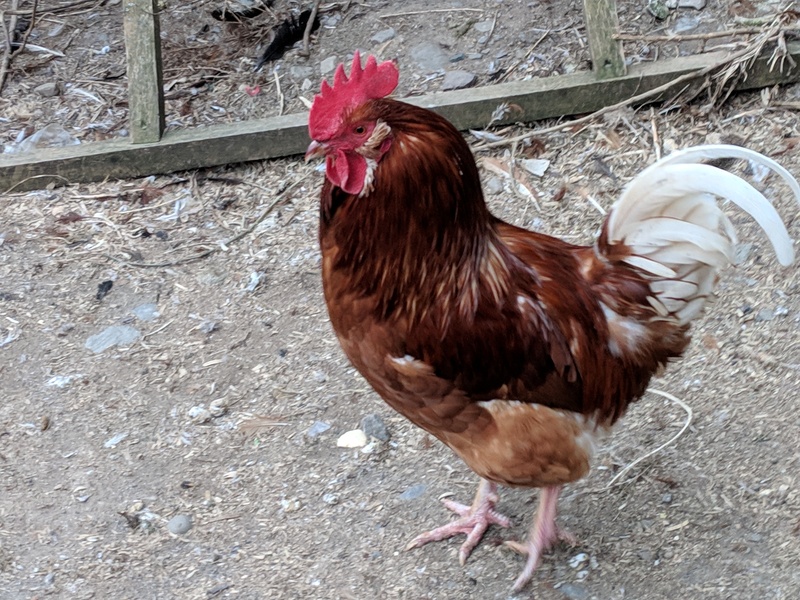 Is he jealous of my attention paid to the younger roosters? Is he confused because I have lost 96 lbs and no longer look like the Mom who raised him? 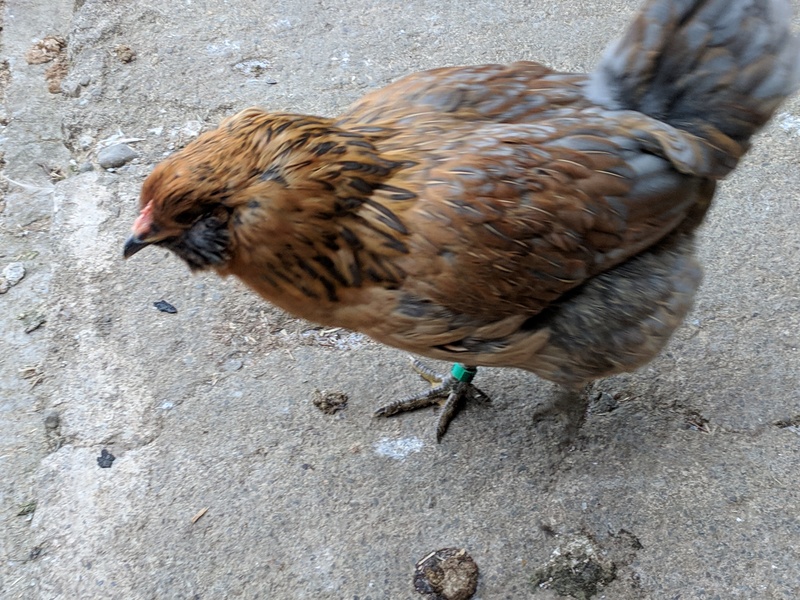 Or is this a change in hormones or temperament? 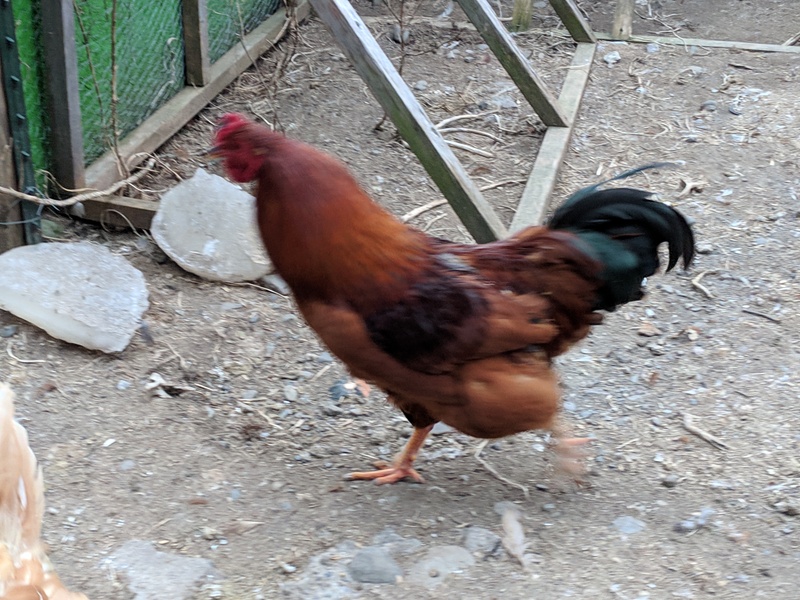 He’s three years old, though and in that time, he has never been a bad rooster. He still is letting me pick him up and carrying him. Still likes pets, neck rubs and water massages. I just don’t know what to make of this. I hope I don’t have to make a hard decision. I went down to the coop this morning and found this little chick peeking out from under Briar. There are two more eggs to hatch and I hope they do. Today is actual Hatch Day so there is still plenty of time for them to join us in the big wide world.